In doing research for my Boeing 787-8 "Dreamliner" project, I decided to model the engines. 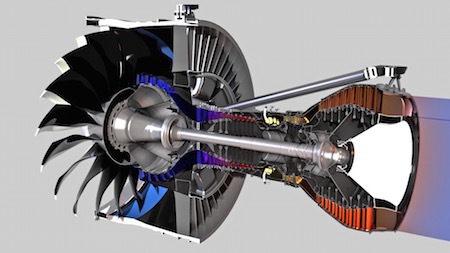 At the time I'm posting this, both Rolls-Royce and General Electric have made powerplants for the 787. I decided on the GE engine, simply because I was able to get better documentation for it. This model is as accurate as I could make it, given the resources, but I can't claim complete accuracy on this engine, for two reasons. Although GE was very generous in providing me with some orthographic drawings, but naturally, they keep some things proprietary. Secondly, this model was created with single-wall parts, which slightly affects the technical accuracy, but reduces the polygon count by more than half… a great savings for those of you who want to use it on another model, or simply make some nice renderings. The video below is simply a slideshow of renders made during the high-res model's building, to give you a feel for the structures. This movie may take a few moments to load. Engine is organized into real-world hierarchies, so you can display individual modules or an exploded view. Component centers are on the main shaft, so the model can be animated.